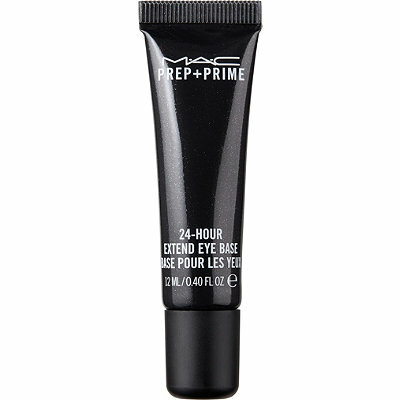 M·A·C Prep + Prime 24-hour Extend Eye Base is a shadow primer specially formulated to prolong the look of your eye makeup. Specially formulated to prolong the look of your eye makeup. This primer keeps eye makeup looking fresh and vibrant all day. Extends the wear of your eye shadow for up to 24 hours! This innovative formula saves shadows from creasing and fading, while allowing hues to stay colour-true for up to a full day. Comfortable and lightweight, it is infused with the rich antioxidant vitamin E and is ideal for all skin tones and types. Extends eye shadow wear by 24 hours. Prevents eye shadow from fading and creasing.